Horses have very specific dietary needs because they are herbivores and have a unique digestive tract quite different from ours. Their long digestive system requires a high-fiber diet that is consumed in small amounts over a long time period. Rather than a few large meals like we should eat, horses eat many, many small meals. Horses actually spend most of their time eating! 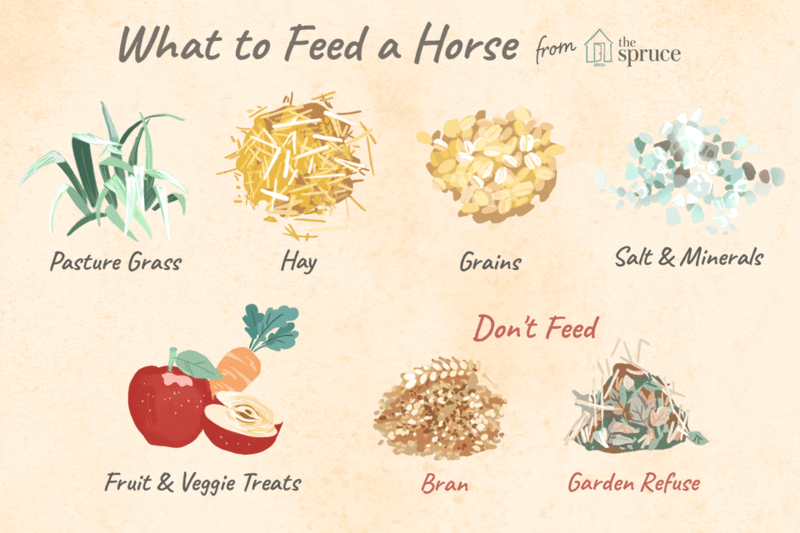 Here is a quick rundown of what horses eat and a few things they shouldn't. The natural diet of the horse is pasture grass and tender plants. Good pasture contains most of the nutrition a horse requires to be healthy. It also contains silica, which is important for dental health. Primitive horses can live on sparse rations and often have to make do with less than ideal pasture and living conditions. This is likely why problems like obesity, equine metabolic syndrome and laminitis are rare in wild horses but occur frequently in our modern horses. Pasture grass isn't necessarily the problem, the type of horses we've developed and the lack of exercise are. Those of us with easy keepers need to limit the amount of fresh grass our horses have access to. Introducing lush pasture suddenly to a horse not used to it can cause serious problems as well. For the horse that is a hard keeper, however, good pasture provides the best nutrition. Many of us don't have the luxury of being able to let our horses graze on pasture throughout the whole year. When grass isn't available, hay is the next-best choice. Finding good horse hay can be tricky. It helps to have hay tested so that any shortfalls in vitamins and minerals can be compensated for with supplements. For some horses, rich hay can be a problem in the same way rich pasture grass can be. ​Easy keepers may need to be restricted from 24/7 access to a bale feeder. Oats are a traditional grain fed to horses. However, horses may also be fed small amounts of other grains like corn. Some grains like wheat, aren't good for horses. The seed head of grasses would be the closest thing a ​wild horse would come to eating grains in their natural environment. Grains that are grown, harvested and processed as we do now, are not natural foods for horses. It is easy to feed too much grain to horses. Grain also doesn't require the chewing time or contain the silica grass does and this can contribute to things like ulcers and dental problems. A horse that over-eats a large amount of grain may colic or founder. Concentrates are usually a mixture of things like grains, flax seed, beet pulp, molasses for energy and flavor, bran, vitamins and minerals, and other ingredients. Commercial mixes may have a number of ingredients in them or some feed mills will mix concentrates to your specifications (only practical when you have a large number of horses to feed). Concentrate mixes, like grain, help make up for any shortfall in nutrition and provide a quick source of energy. Mares in foal, nursing mares, performance or working horses often benefit from being fed concentrates in addition to grass or hay. Supplements such as salt and minerals may be included in a concentrate mix or may be offered separately. 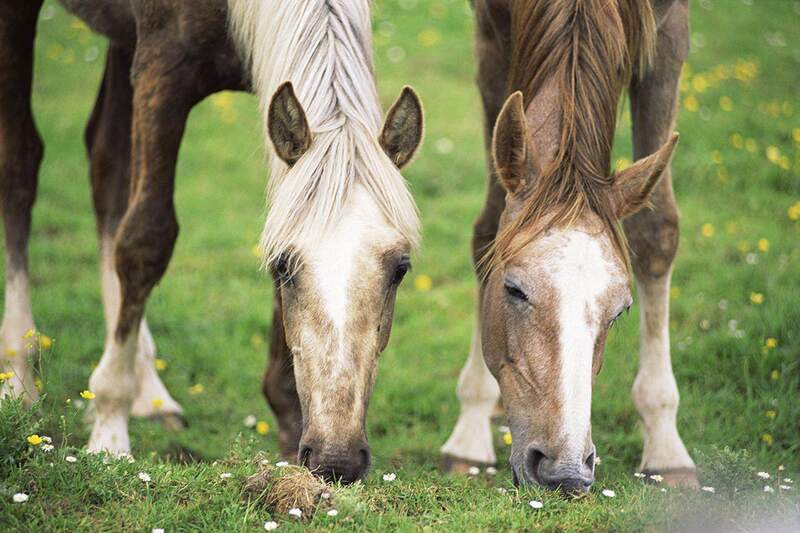 A salt block or loose salt in a pasture or stall allows horses to help themselves when they have a craving. Some salt may come mixed with minerals. Some people offer free choice minerals as well, or it can be added into the horse's grain or concentrate meal. Many people find that salt is consumed more during the summer months than in the colder weather. Many of us like to feed our horses treats. These tidbits may include things like apples, carrots or other favorite fruits or vegetables, handfuls of grain, sugar cubes or candies, or sometimes odd things like a bite of a hot dog or boiled egg. I'm not a fan of feeding meat or too many sugary treats (including fruit) to horses. Horses are herbivores, and even though a horse may not show outward signs like colic when fed meat, they may still feel some discomfort and strange foods could affect the intestinal flora. Of course, they won't make the connection to the hamburger they ate an hour ago and the discomfort they're having now, so they'll probably eat any food they like over and over again. It's important to feed treats in small amounts. Treats need to be considered as part of the overall feeding plan and kept to a minimum if your horse needs to watch its weight. Your horse also needs to be respectful when being fed treats. Of course, a horse doesn't really 'eat' water. However, water is an essential part of the equine diet. A horse eating pasture grass probably won't drink as much water as one on a hay only diet. However, for both, clean fresh water is essential. Brans, including wheat and rice bran, are not recommended as a major part of your horse's diet. All can cause mineral imbalances. Don't be tempted to throw lawn clippings, garden refuse or compostables over the fence. All can contain plants toxic to horses.